The repealing of the Illegal Migrants Determination Tribunal Act of 1983, following the recent Supreme Court judgement, is becoming a political issue with pro and anti forces taking to the streets. The 24-hours Assam bandh by the All-Assam Minority Students Union yesterday witnessed sporadic incidents of violence in various parts of upper and central Assam. A series of meetings have taken place and many more are to follow as the Congress makes all-out efforts to forge a secular front for the coming Bihar Assembly poll. Efforts are on to bring together the warring RJD and LJP leaders Lalu Prasad Yadav and Ram Vilas Paswan besides the NCP and the two Left parties. Controversial RJD MP Mohammed Shahabuddin is in fresh trouble with the police seeking his prosecution on sedition charges and a local court today issuing separate non-bailable arrest warrants against him for possession of illegal items, including firearms and vehicles. A Delhi court today rejected the plea of former Haryana IG (Prison) R.K. Sharma for increasing the number of dates for recording the evidence in journalist Shivani murder case as his counsel had contended that it was necessary for early disposal of the trial proceedings. After the scare which the monsoon-2005 gave the country after it hit the first mainland entry point Kerala four days late on June 5, followed by almost 49 per cent rainfall deficiency recorded till as recently as June 22, it is now raining in excess in most parts of the country. Even as the Union Government is contemplating changes in the education policy aimed at achieving universalisation of primary education, three organisations working in the field of child rights, have moved the Supreme Court seeking ban on child labour to ensure that 100 million children between the age group of 6-14, get schooling opportunities. Despite controversy over his alleged underworld links, Salman Khan's "Maine Pyar Kyun Kiya" is running to packed houses across Maharashtra. Attempts by Shiv Sena and Bajrang Dal workers to disrupt the screening of the movie were toned down by the police today. 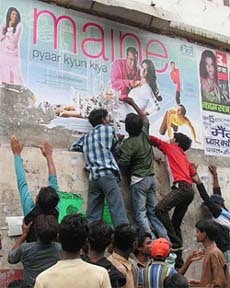 In places like Nagpur, Nashik, Aurangabad and Amravati in Maharashtra the screening of the film resumed one day after mobs of these groups attacked theatres. The police has rescued a 16-year-old girl sold for Rs 50,000 in Shajapur district and arrested a couple for forcing her into flesh trade. On July 14, the police rescued the victim from Lolki village and arrested a couple in this connection. A local court today sent notorious poacher Sansar Chand to police remand till July 24. The poacher, arrested by the CBI last month, was brought here from Delhi on a transit remand. Framework for India-US defence pact misleading, says former defence minister. Music of "Mangal Pandey—The Rising" released in New Delhi. The repealing of the Illegal Migrants Determination Tribunal (IMDT) Act of 1983, following the recent Supreme Court judgement, is becoming a political issue with pro and anti forces taking to the streets. The 24-hours Assam bandh by the All-Assam Minority Students Union (AAMSU) yesterday witnessed sporadic incidents of violence in various parts of upper and central Assam. There were clashes between AAMSU and BJP activists. Incidents of violence were also reported in central Assam as AAMSU activists attacked All-Assam Students Union (AASU) workers. Ever since the Supreme Court scrapped the IMDT, AAMSU activists, as well as various minority organisations, including the Jamiat-Ulema-E-Hind and the United Minority Front have taken to the streets protesting the same. The Jamiat-Ulema-E-Hind and the UMF have even demanded the resignation of Chief Minister Tarun Gogoi for failing to protect the minority Muslims in the state. But the incidents of violence during the Assam bandh by AAMSU clearly indicated a sharp polarisation on the IMDT issue where the Assamese Hindus and Hindus from other parts of the country supporting the judgement and the minority Muslims opposing the same. Even though the All-Assam Students Union (AASU) advisor, Dr Samujjal Bhattacharyya, cautioned all political parties not to politicise a social issue like infiltration, efforts are already on to gain political mileage from it. Sources said Mr Gogoi requested the Prime Minister and the Union Law Minister to explore the possibility whether another special act could be framed for the minorities in Assam to replace the IMDT. On its part, the BJP state leaders met at the party headquarter in the presence of the party’s General Secretary, Mr Pramod Mahajan, yesterday evening to review the fall-out of the Supreme Court judgement. Hailing the Supreme Court verdict as “historic one”, Mr Mahajan said his party would try to foil any attempt by the Congress to enact a new law to protect the illegal migrants. Going by the official statistics, a little over 2,000 illegal migrants were detected and deported through the IMDT Act in the past 22 years since 1983 and over 2.5 lakh cases were pending. In this connection, Mr. Digvijay Singh, AICC general secretary in charge of Bihar, had a second round of discussions with RJD chief Lalu Prasad Yadav today to convince him that the Congress will stand with him this time. This will be followed up with a meeting with LJP president Ram Vilas Paswan on July 21. He has already met CPI leaders A.B.Bardhan and D.Raja and sounded out NCP chief Sharad Pawar. While the NCP has agreed to be part of this alliance, the CPI has expressed its reservations. Mr. Singh has, therefore, urged its state unit and the RJD chief to hear out the CPI state leaders. The Samajwadi Party (SP) is not being treated as an untouchable despite its troubled relationship with the Congress in UP. Mr. Digivijay Singh said he will approach SP leader Mulayum Singh Yadav in the coming days ,primarily to hear his views on the formation of a UPA-like secular front in Bihar. Although the RJD leader has declared that he has no objection doing business with Mr. Paswan, the latter is still holding out. Realising Mr. Paswan’s difficulties in having an electoral pact with Mr. Yadav after having waged a bitter battle against him in the last election, the Congress plans to present him with a face-saver. It has already declared that the issue of chief ministership be decided after the elections. The Congress is hoping this formulation will be acceptable to Mr. Paswan given his strong antipathy to Mrs. Rabri Devi’s candidature for the top post. Mr. Yadav has already rejected this suggestion but the Congress is hoping to convince him in the coming days. “The RJD leader is a very pragmatic leader,” remarked a senior AICC functionary. While these “confidence building measures” with the RJD chief will continue, Mr. Paswan will be advised that the secular front remains his best bet. He will be explained that he cannot afford to go with the NDA as he would lose the support of the minorities. Going alone could prove suicidal and forging a “third front” with the CPI (ML), the SP and other such parties will split the secular vote and only facilitate the formation of an NDA government, goes the Congress argument. On his part, Mr. Digivijay Singh is confident about bringing Mr. Paswan on board. He was all praise for the LJP chief. “ He is a mature, seasoned leader.. he proved his secular credentials by resigning from the NDA on the issue of Gujarat riots,” he observed. Officiating Chief Judicial Magistrate S. S. Srivastava ordered issue of warrants of arrest against Shahabuddin on the prayer by the police in connection with the recoveries made during the raid at his ancestral house at Pratappur village in Siwan district on April 24. The police had yesterday moved the court here seeking issuance of non-bailable arrest warrants against him and others in five separate criminal cases, including one charging him with sedition and collecting arms with an intention to "endanger national unity". The police sought the court's approval for prosecuting Shahabuddin under sedition charges in case no. 44/05 registered by the police in connection with recovery of Pakistani cartridges during the April 24 raids. Shahabuddin is also charged with possessing foreign currency besides power theft. Shahabuddin had, however, on July 13 received a respite with the Patna High Court staying a warrant of arrest against him issued by the Siwan District Magistrate Santosh Kumar Mal on the application of Crime Control Act (CCA) against him. On July 1 Mal had given additional time to the police to execute the warrant after it failed to produce the MP before him within the stipulated period which ended that day. He had rejected the plea of the MP's counsel seeking recall of the DM's June 22 order of arrest and gave the police time till July 15 to arrest and produce the MP. Mal had issued summons to Shahabuddin on an order by his predecessor C.K. Anil to book the MP under the Bihar Control of Crimes Act (CCA) for his alleged involvement in criminal activities. Shahabuddin's failure to turn up had prompted Mal to issue an arrest warrant against him on June 22. Earlier, Anil had applied CCA on the MP and on February 18 externed him apprehending breach of peace during the Assembly polls in the state on February 24. However, that order was later overruled by Saran Divisional Commissioner C Lal Sota prompting the then District Magistrate to issue a fresh order on May 16 to book him under the CCA. Sharma, a key accused in the murder of Shivani, a senior journalist of the Indian Express, had sought increasing the hearing dates from existing eight a month to 12 for recording the evidence. Additional Sessions Judge Sunil Gaur said the court was also dealing with other important cases, including bail applications and it was not possible to devote 12 days in a month merely on a single case. Sharma had also cited the assurance given by the prosecution to the Delhi High Court about completing recording of evidence by September during the hearing of his bail petition, which he had withdrawn after such an assurance. Sharma has been lodged in Tihar jail in the four-year-old murder case since his surrender to the police after he remained underground for over a month after the alleged crime. The court has yet to examine 34 witnesses, but most of them are only police officials, not so crucial with the point of prosecution, while it has so far examined 182 witnesses. In fact, heavy rains in most regions, barring eight out of the 36 meteorological subdivisions in the country, have completely neutralised the rainfall deficiency recorded in June, which is now one per cent above normal till July 14 as per the met department. While rains are playing havoc in some areas and Punjab and Haryana specifically have recorded 67 per cent and 85 per cent above normal rains till July 14, respectively, monsoon has not been behaving itself in several parts of the country. These include Assam and Meghalaya, Jharkhand, Bihar, east Utter Pradesh, coastal Andhra Pradesh, Tamil Nadu and Pondicherry. Why these eight subdivisions have fared poorly? Met officials attribute it to some technical jargon best understood by them, but which broadly means that monsoon-giving system has not been so effective in these areas. But they admit they could not predict the rainfall deficiency in the North-East and early monsoon in the north, this year. Incidentally, considering the criticism the India Meteorological Department has been receiving for not being able to predict floods and drought several times, there are talks of it finally getting a new model to improve its monsoon prediction and weather forecasting. The rainfall deficiency of 49 per cent recorded on June 22, says the met office, was subsequently made up for during the last week of June when monsoon revived vigorously and improved the rainfall situation over the country. By June 30, the cumulative rainfall deficiency over the country as a whole significantly reduced further to 15 per cent. Heavy rains in the first week of July bridged the gap further and brought the deficiency down to seven per cent. And now it is in excess. In central India, the monsoon is 18 per cent above normal and in the south, just 3 per cent above normal. Punjab and Delhi, also including Haryana and Chandigarh, have seen significant excess this season till date, say met officials. While Punjab received 191.4 mm rains as against a normal of 114.4 mm, recording 67 per cent more rainfall than normal during this period, for Haryana, the percentage has been as high as 85 as the state along with Delhi and Chandigarh, recorded 200.9 mm rains as against a normal of 108.5 mm in this period. Delhi on its own recorded 229.7 mm rains as against the normal of 147.3 mm. The petition, by Hyderabad University professor Shantha Sinha, a Magsaysay award winner and secretary trustee of M.V. Foundation working for the welfare of underprivileged in 500 villages of Andhra Pradesh, Delhi-based organisation Haq and the Centre for Child Rights and Social Jurists which is a body of lawyers taking up civil rights matters in the court of law, has sought a direction to the Union Government to bring all the labour and child-related laws in conformity with various Articles of the Constitution on Fundamental Rights to prohibit exploitation of children. The main legislations, which though protected the life and liberty of minor children but being violated with impunity, include Child Labour (Prohibition and Regulation) Act, 1986, Plantation Labour Act, 1951, Children (Pledging of Labour) Act, 1933 and Apprentices Act 1961, a public interest litigation (PIL) moved by the three organisations through their counsel Ashok Agarwal said. They said all these legislations required to be moulded in conformity with the provisions of Fundamental Rights spelt out in the Constitution and in accordance with the UN Convention on the rights of child, International Labour Organisation’s Minimum Age Convention, 1973 and other Constitutional laws declared by the Supreme Court from time to time in its judicial pronouncements on the issue. The petition is likely to be listed for hearing soon. The petitioners said since under Article 21 of the Constitution it has been clearly laid down that any form of labour by a child below the age of 14 is prohibited, therefore, it should be clearly declared by the court through its judicial pronouncement that any form of child labour would be illegal. “Even after 57 years of independence of our country, out of 200 million children in the 6-14 age group, 100 million are estimated to be out of school and engaged as child labour, whereas compulsory shooling has been envisaged in Article 21,” the PIL said. The PIL said while over 100 million children from poor families were out of schools, estimated 12 million of them were in the regular employment in economic, non-economic and household activities as per the 2001. Of the 100 million children who are unable to attend the schools, over 60 million are girls, the petition pointed out. "The film is running houseful at all our theatres and no tickets are available for the weekend," a manager of Fame chain of multiplexes told this reporter. According to the trade the film has drawn good initials and is likely to become a hit if the trend continues for the next few weeks. After two days of silence, Salman Khan denied reports that he had threatened actress Aishwarya Rai to participate in a show organised by gangster Abu Salem. In an interview to a newspaper here, he said that the voice on the tapes purported to have been threatening Rai was not his . Meanwhile, the newspaper which originally carried transcripts of the phone conversation allegedly featuring Salman Khan's threats published a photograph of the actor with gangster Dawood Ibrahim's brother, Noora. Another report said the actor used to regularly visit parties thrown by Ibrahim in Dubai. The police has rescued a 16-year-old girl sold for Rs 50,000 in Shajapur district and arrested a couple for forcing her into flesh trade. On July 14, the police rescued the victim from Lolki village and arrested a couple in this connection. The purchaser Moda Singh and two other accused have absconded. The girl, daughter of a government school peon residing in Kundla village, was lured by Khankhedi hamlet-based Gopal Meghwal and his wife Amribai two months ago on the pretext of taking the victim to her maternal aunt’s place at Manasa. When the girl failed to return, her relatives began making enquiries and were shocked to learn that the victim had not even reached her aunt’s home. On July 10, an FIR was registered at Kukdeshwar police station. A local court today sent notorious poacher Sansar Chand to police remand till July 24. The poacher, arrested by the CBI last month, was brought here from Delhi on a transit remand. He was produced before District and Sessions Judge V.K. Saxena who accepted the plea of the Rajasthan police and remanded him in police custody till July 24 for interrogation.